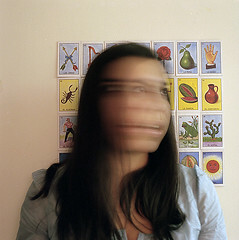 The images below are taken from the blog of Calarts photographer Erin Azouz. My mom always said “The best artists always know how to have fun!” Seeing these silly photos that Erin posted on her blog brought a smile to my face and made a great day even better. I guess some people just know how to have fun better than others. When I graduated from Calarts almost all of the other Chicano/Chicana students in the art department seemed to have left with me. I was struck wondering who would fill the gap at Calarts and hold things down. I was heartened to stumble across the work of student Erin Azouz. Her Identity Series has long been a favorite of mine. Her combination of cultural confusion, suicide, and the semiotics of Mexican-American folk culture articulate so much better what I struggled to present with my own work in my early years at Calarts. Homegirl is also a fascinating animator. I’m not sure if she’s ever labeled her work as animation but one look at her videos and I can’t think of a better way to describe her brilliant sequencing of still images. Depending on the Light is my favorite of her video projects. Erin describes it as “one of several visual responses to a paper i am writing about psychosomatism, with an open exploration of the mind (my mind); eastern philosophy provides the antidote.” Check it out below. For the record, I intend to shamelessly steal the techniques she uses in her Summer 2008 video. 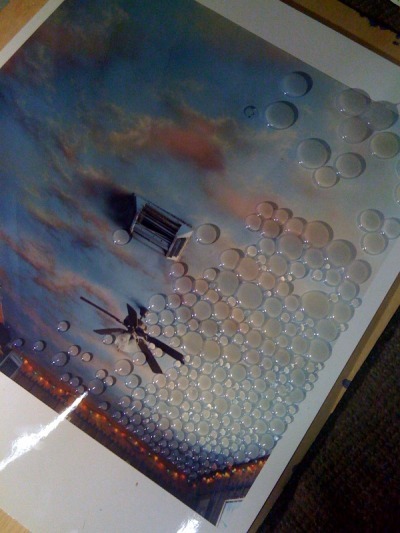 Some of her recent work includes a series of c-prints meticulously covered in drops and patterns of hot glue. I was intrigued by them and wrote to her asking about them and she gave me the interesting response of “the hot glue bubbles I think about as an extension of the photographic print, as well as an emulation of the nature of film grain. I think the hot glue is a lot about the process of photography itself, and for me it contributes to the produced or ‘plastic’ quality of the photographic image. 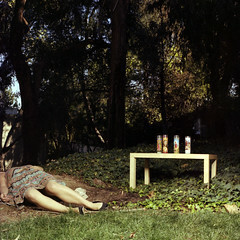 The idea that the photographic image is an objective viewpoint (i.e. that the camera just ‘sees’ what it sees and the photographer is merely a passive observer) has plagued photographers throughout the cultural history of the still image. I have been dealing a lot lately with issues of authenticity. In an age of digital photography when any shot can be ‘the’ shot, and we can take literally hundreds of thousands of pictures of the same thing from every angle, we must begin to question whether our cameras are oppressors or liberators of the photographic image. The hot glue is a decorative and illustrative element to signify the end of the ‘age of analog’ and aim to bring new questions to the discourse of authenticity in photography. Does authentic even exist in this digital age?”. I can totally dig it. Hopefully Erin will post more from this project soon. I’ve never actually met Erin but we keep talking about having a print exchange one of these days. Hopefully it’ll happen soon; Erin graduates this year from Calarts and your boy Rio wants to wish her the best in her next adventure, whatever it may be. 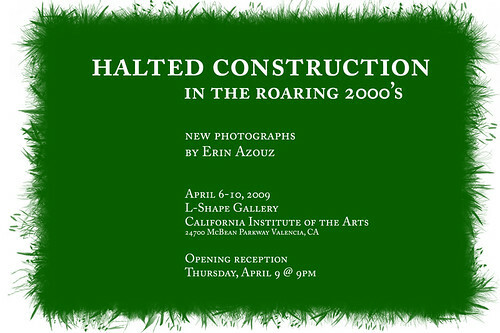 Erin Azouz’ thesis exhibit will run from April 6th to the 10th in Calarts’ L-Shape Gallery. Coincidentally this was also the location of my thesis show. Fancy that! I’m going to try and make it out for her reception. I truly believe Erin is going to be doing big things with her art, get in on the ground floor while you can.